If you were to ask most working people what they enjoy most about their jobs, most would say the compensation. It’s a fact that when people are not satisfied with the salary, benefits, perks and other incentives offered by employers, that they simply move on. A Gallup Poll indicated that as many as 70 percent of American workers are generally unhappy about some aspects of their employer – keeping them disengaged and unproductive. The secret to maintaining a strong workforce is understanding the psychology of how employees perceive their benefits programs, perks, and other incentives that they have access to. This is an ongoing effort of digging deeper to understand what drives employees to find happiness in the work they do. Especially important during employee onboarding, open enrollment, and performance review periods, it’s up to the human resources team to understand this critical factor. While these are not the only reasons why a person would choose to work with a specific company, these are the main forces behind the decision. In an age where jobs in some industries are growing scarcer, sometimes people just take the best job they can find in the area of interest that they can find. Fortunately, due to the Affordable Care Act requirements, more employers are required to offer at least the minimum health insurance benefits, which makes it easier for working people and their families. In the entire scheme of things, the psychology that moves people to work for any employer often comes down to the benefits and other perks offered. People are focused on managing their personal lives and therefore having health and financial well-being are primary goals. This is the basic principle behind Maslow’s Hierarchy of Needs, a classic psychological theory of what motivates human beings. In order to be productive members of society and think on higher levels, people need their basic physiological needs met. These needs are vital to survival, and they include the need for air, water, food, and sleep. Safety needs are the next level on the pyramid of needs, which include the desire for employment, health care, and shelter. Companies that offer above-average benefits, incentives, progressive salaries, and comfortable working environments are doing so to attract a better breed of employees. They are also tapping into the theory above because they are providing some of the safety needs of employees. When employees believe that their employer is giving them the benefits of employment, including health benefits, financial benefits, and other positive incentives – they are more likely to stay on board and provide their work in return. It’s possible to provide just the bare minimums in terms of employee benefits, perks and incentives. However, this is risky because when employees learn that another employer can offer them more, they will soon leave. 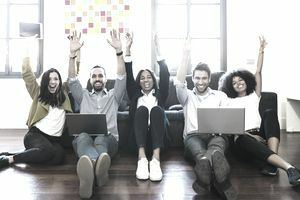 It is far better to provide generous and relevant benefits and incentives to employees, who, in turn, will be more engaged, happy, and loyal to the business bottom line.